School may be out for the summer, but it is the perfect time for schools to consider repaving and repairing the school parking lot. Large paving projects, like parking lots, require a number of keys factors to ensure the best results: expert contractors for time and project management; a contractor with a thorough understanding of the best solutions for the project and the best materials for the job; and lastly, a maintenance plan to keep the school lot looking its best. Wolf Paving has been paving driveways, parking lots and highways since 1941 and is proud to review these key factors in more detail, to make sure you get the best service and parking lot, possible. It isn’t your job to know the asphalt industry and the best materials and repair solutions for your parking lot; but you’ll certainly be required to find a contractor who does know. There are many options that may work for your school parking lot, and your contractor should walk though a number of them with you, based on your immediate needs, budget and time restraints. Cleaning or Sweeping - You might be surprised to learn that a good asphalt cleaning can make a big difference in the look, surface texture and overall lifespan of your asphalt parking lot. Cleaning will remove surface dirt and debris, and also clean away harmful vehicle fluids that can deteriorate your asphalt prematurely. Being proactive and cleaning your asphalt surface can save you money over time and keep your lot looking fresh and new. Sealcoating - A sealcoat application protects and prolongs the life expectancy of asphalt parking lots by filling in surface damage and providing a protective layer to keep out damaging UV rays, vehicle fluids and water. Sealcoating should be completed every 3-5 years to protect the asphalt surface and to give the surface a fresh look. Pothole and Crack Filling - If your parking lot is in good condition, with only a few cracks and potholes, you may only require some spot treatment repairs. Potholes and cracks are caused by the expansion and contraction of water after it has entered into the ground under a pavement surface. It is important to regularly fill in cracks and potholes to help reduce the damaging effects of water runoff and prevent further expansion of trouble areas. Asphalt Overlay - Asphalt overlays make up a significant portion of roadway and parking lot paving work done today. Your parking lot may be a good candidate for asphalt overlay if it is structurally intact, level and capable of bonding to the overlay. To complete this process, the existing pavement is usually repaired, leveled, cleaned and then coated with a binding agent. Repaving - If you parking lots has large areas of alligator cracks or is crumbling, you may need to consider a complete repaving. Your contractor can work with you to determine the scope of the project and can outline exactly what needs to be done. 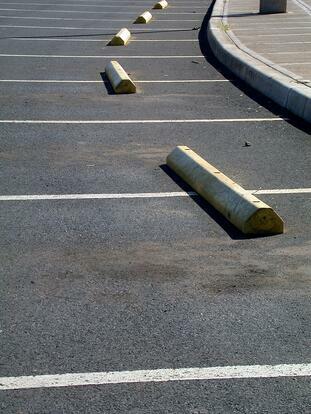 Rest assured that your new parking lot will provide a safer surface for vehicles and pedestrians alike, and with proper preventative maintenance, your new asphalt parking lot can last upwards of 20 years. Depending on your school’s needs, you may want to consider different pavement options. Perpetual Pavement - Perpetual pavement is based on a multi-layer paving process designed to extend the useful life of a roadway or parking lot. It starts with a strong but flexible base to prevent cracks in the bottom of the pavement. A strong, permanent middle layer is added and then topped with a durable driving surface that will last for several years but is periodically replaced. With perpetual pavement, only the top layer is removed and replaced which reduces the work time and long term costs significantly. Porous Asphalt - Porous asphalt is a great option for parking lots because it allows water to drain through the surface and into the natural water table, enhancing storm water management and improving the quality of ground water. One of the key benefits of porous asphalt is that many municipalities consider it as a green paving option, meaning is can add to your green infrastructure and reduce negative environmental impacts, even if you plan to expand your parking lot surface area. To extend the life of your asphalt parking lot, it is essential to include regular preventative maintenance in your budget and timeline. If you liked this article, you may also be interested in 9 Important Asphalt Paving Budget Tips For Property Managers. Do you have any questions about your school parking lot? Let us know in the comments and one of our expert team members will be happy to help!